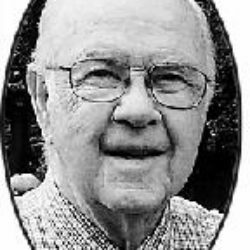 LEESE JAMES REED, Age 86, of Birmingham, passed away suddenly on May 5, 2012 in Mystic, CT. Jim was born in York, Pennsylvania on May 20, 1925 to Reed O. and Mary Loucks Leese. Jim spent his career working for Michigan Bell Telephone Company (now AT&T) and except for two years during the Korean Conflict when he was recalled into the Navy in Boston, and four years working for AT&T in Manhattan, they have lived in Michigan, spending the last 51 years in Birmingham. Jim rose through the ranks at Michigan Bell to Division Level Manager during a 35-year career before retiring in 1984. Jim and Bev enjoyed many foreign and domestic travels and cherished the time spent at the family cottage on Lake Huron in Oscoda. Jim’s passions were singing and golf. He was an avid golfer, a poor putter and considered eagling a par 4 and par 5, and a hole-in-one on par 3 his biggest “wow” moments. As a member of the Birmingham Senior Men’s Club, he often led the singing during their meetings. He sang for the last 51 years in the choir at Northminster Presbyterian Church in Troy where he also rang bells, was an elder, and served on various committees. His other love was the Grunyons, an all-male, a cappella vocal jazz group in the Detroit area. Jim was traveling with the Grunyons to Mystic, CT for their annual Spring Sing at the time of his passing. Jim leaves behind daughter Abbie Holden (Tom) of Northville, MI; son Michael Leese (Maxine) of Renton, WA; grandsons Jim Holden, and Graham and Sean Leese; several nieces and nephews and many loving friends. Jim was preceded in death by his wife Beverly, his parents Reed and Mary Leese, and his sister Pauline Huston.